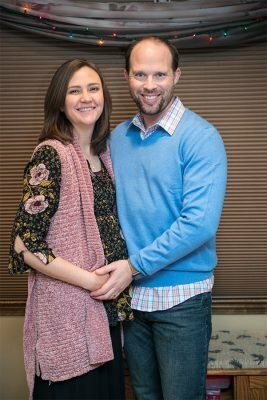 An Exciting Announcement from Nathan and Melanie Maxwell! This was posted on December 12, 2018 by Nathan. We are pleased to announce that Melanie is expecting, due in May. Specifically, due on Abby’s birthday. 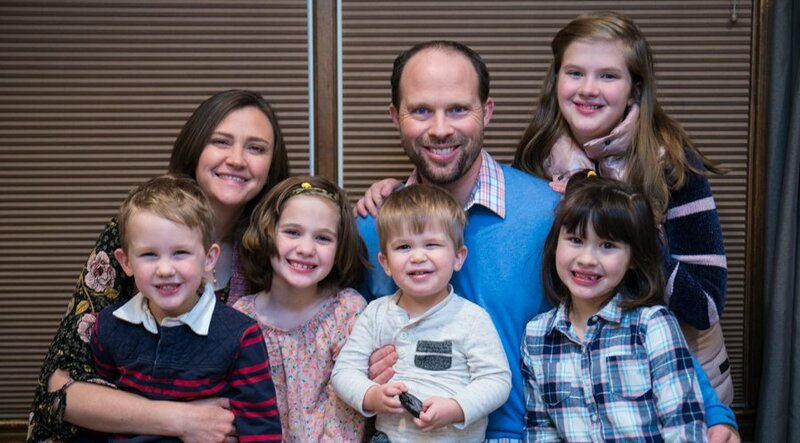 Announcements like this are always a mixed blessing as we hope for another child to hold, and concern over the inevitable challenges that pregnancies bring. We are grateful for an OB that handles Melanie’s “high risk” label with appropriate care. We are grateful for progesterone prescriptions. Melanie is extremely grateful when I remember to replace the draw needle with the injection needle (hint, the draw needle is much larger). We are also grateful to have families that value children and support us in these journeys. Benjamin is not quite sure he wants to give up his family “baby” status, but the rest of the children are extremely excited. We covet your prayers these next five months. Will be praying all goes well. Thank you. So grateful for your prayers. Congratulations!!! Will be praying for you all!! This is wonderful news.God has truly blessed your family. I will keep Melanie in my prayers. Congratulations! We will be praying! Congratulations! I am praying for a relative uncomplicated pregnancy and birth for you. I remember I have started following the blog just around the time Abby was born. What an incredible journey for your family. Witnessing your love and continued faith in God through the years have inspired me a great deal. Even though we live thousands of miles away, I am sending you all of my love, support and prayers. Thank you, Alice. I agree. They are an inspiration: years of infertility, loss of their first baby 3 days after birth, difficult pregnancies with progesterone the whole pregnancy (and Melanie doesn’t feel good on the progesterone. ), and smiles on their faces with this announcement because of what you said – love and faith in God. I think 3 and 3 would be perfect too. I can just picture three little boys. Steve and I met Melanie in Home Depot one day recently. She had Drew and Benji in the shopping cart. We don’t often see just the two boys together since the girls are usually with them. Those little boys were sure cute in that cart! Of course the little girls would enjoy a baby sister after two baby brothers. I am due with #7 in May also. Congratulations, Nicole. Thank you. So grateful for your prayers. Praise God! Yes, I will join you in prayer! Wonderful news! I’ll be praying for you during the challenge of waiting and trusting in the next five months! God Bless. Praise the Lord! She looks great. So happy for them, praying for a healthy rest of the pregnancy and safe delivery! I agree. Melanie is beautiful and radiant! Thank you for praying. I am thrilled for them, and have already begun praying for Melanie and the baby (and will continue). They let the children make phone calls to each of us telling the news. Aw, that is fun for the “big” sisters and brothers to get to share the special news! This is amazing! Congratulations to Melanie and all the rest of you! I was so excited to read this! Melanie has always been an inspiration to me as I search for faith and comfort in my own infertility journey. I’ll be praying for a smooth pregnancy and safe delivery. Thank you for praying. Infertility is a very difficult journey. I pray the Lord will give you peace, contentment, and lots of babies to carry and birth. Thank you, and thank you for praying. Yay! Will definitely be praying. My cousin is pregnant with their third baby, and she is also due in May, near my birthday! After losing Mom this summer, a new baby in the family is giving us something wonderful to rejoice about now, especially with Christmas coming! Thank you for praying. Special that your cousin’s pregnancy can bring some joy in your grieving. Oh boy, was I excited to read the title of this post!! Congratulations to Nathan and Melanie! Praying for Melanie and their precious baby! Thank you. Very grateful for your prayers! God is SO good! Congratulations Maxwell family! You are SO blessed! Amen! God is so good! Thank you. This is just a layman’s answer. From what I understand, early in pregnancy it helps prevent miscarriage when the progesterone numbers are low. Then for Melanie, later in the pregnancy, it has helped keep pre-term labor at bay. I have been praying for Melanie and for the baby! We are thrilled for them. I know that feeling of joy/anticipation while your heart is a bit cautious/overwhelmed due to being high risk. But the Lord is so Faithful to hold our hands and our hearts every step of the way. Praise God! Continuing to lift you up in prayer! Yes, Dessiree, you can relate, can’t you? There is a different mindset that goes with the high risk pregnancies than for those of us who had no trouble with pregnancies. This is wonderful news!!! I have prayed for Melanie with each pregnancy. Actually we have carried a few at the same times! She will be in my prayers! That’s very sweet, Wendy. Thank you for praying this pregnancy too. Wow! So exciting! I know her pregnancies have been difficult, but she looks amazing. It seems as though she is doing everything within her power to be as healthy as she can be to have a good pregnancy! Way to go Melanie! So proud of you all and your steadfastness in trusting the Lord, even when it’s not always easy! Praying for you! Very encouraging words for Melanie, Debi. I’m SO happy for your family, Nathan and Melanie! May the Lord bless both you and baby with radiant health! Congratulations! I have to admit, I’ve been wondering, as in a few posts recently it appeared there was often a child placed strategically in front of her midsection. Praying all goes well. Thank you for your prayers. You are very perceptive, Kristy. I’m the oldest of a large family (and I’m a mom now as well) so I guess you could say I’ve seen the tricks moms use when they’re starting to show but not ready to announce! Congratulations to all! Melanie grows more beautiful with each passing year, I admire her/their faith to continue to accept the blessing of children even knowing the pregnancy is likely to have challenges. We announced our May-baby pregnancy during this week last year, and now she’s asleep on me as a 6 month old. It was our 10th pregnancy, and she’s our 6th living baby… so we understand loss and will be praying for a happy outcome for them. Gwenyth, your words and story brought tears to my eyes. So happy you have a sweet 6-month old to hold as your sixth living baby. Thank you for praying for Melanie’s pregnancy. So happy for you! Will pray for healthy baby and mom! Congratulations to all of you!!! Will be holding you up in prayer! Thank you. Grateful for your prayers. Congratulations!!!! I fear my word will fail me while I try to write this. This is such a well written blog post! I’ve struggle with such guilt with my last 5 pregnancy’s after our baby died because I’m so absolutely thrilled about another baby and then on the other hand struggling with the fears of another pregnancy and birth. The post has helped me see this is normal and I’m not a bad person. I so greatly appreciate the honesty of this post. If Nathan and Melanie were up to it, it would be very helpful if they shared how they handle the stress and worry. I totally understand though if they prefer not to. Congratulations again on such a blessing! Thank you. So glad, Sandi, that Nathan’s post could be an encouragement to your heart. Delighted, too, that you have another little one on the way. There have been other comments sharing the struggle with emotions in pregnancies after the loss of a baby. All very normal! Nathan and Melanie are reading the comments so we’ll see what they think about your suggestion. Congratulations!! I’ve frequently used Nathan and Melanie’s story of trusting the Lord in the matter of children to encourage others. So happy to hear of this newest blessing. Congratulations! Melanie has been an inspiration to me over the years. Her trust in the Lord is obvious through her radiant smile! Her family will be in my thoughts and prayers over the next few months. Praying for a safe passage into this world for this new little one. Love your precious family and will be praying for Melanie. Thank you. A “C” name would fit a pattern, wouldn’t it? Perhaps a D name for a girl and a C name for a boy? I love guessing about names! Aw congratulations to,you both, you will all certainly be in my prayers. Thank you and thank you for praying. Praying for them and the new baby! I think she looks amazing by the way and so full of joy!! We are expecting our 9th living child ( Lord willing) in the beginning of February. This will be our 9th csection as well. We had a little boy pass away in November of 2017 at 13 weeks gestation, then my mom in April 2018, after suffering a stroke in February 2018, then we conceived unexpectedly in May right after my mother’s passing. This sweet boy has been such a welcomed distraction but we have fought hard this pregnancy with many complications. I can totally understand the high risk issues and pray she can carry this little one and as many more as the Lord sees fit to give them, with no more issues! We also covet your prayers if you guys don’t mind. Praying you all have a wonderful Christmas!! Thank you for praying, Maudie. So exciting about your little one and the extra joy he brings with the sadness of your recent losses. Yes, I will pray for you. Overjoyed!!! May the Lord bless this little one with a long life in service to Him. I have the same issue, and am too very greatful for progesterone shots!! I am expecting #9 and have had to get the shot for my last 3 (but have had some form of progesterone with all but first). Sounds like you give the shot Mr. maxwell, I wish I had someone to give mine! I don’t so have to go in weekly for mine……praying for newest little one, please pray for mine too! Yes, Nathan has been trained how to give Melanie the shot, and it is very convenient since Melanie’s doctor is 45 minutes from their home. Katharine, when is your baby due? Fun news! Will add this to my daily prayer list. I’m guessing for a “C” baby! LOL! Am wondering, did the children make the calls simultaneously to grandparents, aunts and uncles in the same house? Just thinking that would have been funny if many phones had rang at the same time. Yes, a boy with a “C” name would be great! We were actually out-of-town at a wedding when the calls came in so I am not sure of exact timing since we were at the reception by then and no longer all together. We did wonder when we got back together, though, who knew and who didn’t since some still had their phones on silence! Those who knew texted Nathan to see if everyone knew and if we could talk about it. Jesse hadn’t yet gotten a call so we were all quiet about it until Bethany reached him Sunday morning! Yay!!!!!!! Congratulations! I’ll be praying for the baby. I think it will be another girl!